The Shakespeare Birthplace Trust hase graciously contributed images to Shakespeare Documented under a Creative Commons Attribution NonCommercial ShareAlike 4.0 International license. Visitors may download, link to and cite the images for personal research only. Any further use, including, but not limited to, unauthorized downloading or distribution of the images, commerical or third party use, is strictly prohibited. Visitors must contact the Shakespeare Birthplace Trust to request additional use, at: images.scla@shakespeare.org.uk. The earliest reference to William Shakespeare appears in the parish register for Holy Trinity Church in an entry for his baptism on April 26, 1564. The entry reads "Guilielmus filius Johannes Shakspere," or, in English, "William, son of John Shakespeare." Next to the entry, three "X"s added by a later hand highlight its significance. Although dated 1564, the entry, and all other entries before September 16, 1600, are in the hand of a professional copyist who transferred them from an earlier register that no longer survives, in compliance with a 1598 regulation that parish authorities should acquire new parchment registers and copy all existing entries into it. The copyist either miscopied "Johannis" as "Johannes" or copied a mistake made by the original scribe. We may never know the exact day of Shakespeare’s birth. According to The Book of Common Prayer (1559), it was recommended that infants should be baptized on the next Sunday or holy day following their birth, to allow the greatest number of people to witness the sacrament. In “times of necessity,” it was also permissible for infants to be baptized at home. This advice does not seem to have been much heeded in Stratford. 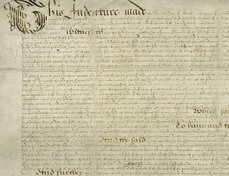 Many baptisms, including Shakespeare's on Wednesday, April 26, did not take place on a Sunday or on a recognized holy day. 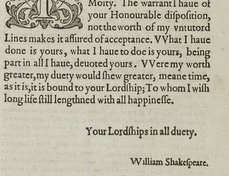 Some evidence concerning Shakespeare’s birthday can be deduced from the inscription on his funeral monument, which states that he died on April 23, 1616, in the 53rd year of his age—“obiit anno domini 1616 Aetatis 53 die 23 Aprilis”—that is, he was 52, having entered his 53rd year. If he had been born after April 23, he would therefore still have been in his 52nd year at the time of his death. However, to have been in his 53rd year, he must have been born no later than April 23. He could, of course, have been born prior to April 23, and some scholars suggest April 21 or 22. Taking the parish register and funeral monument evidence into account, Shakespeare’s birthday is traditionally celebrated on April 23, three days prior to his baptism. 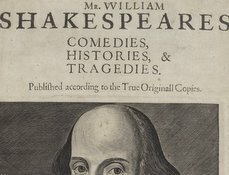 William Oldys, an 18th-century antiquary, first proposed the date, and George Steevens adopted it in his 1773 edition of Shakespeare's works, The plays of William Shakespeare (FSL PR2752 1773b copy 1 Sh.Col). Shakespeare was born just three months before a plague outbreak. “Hic incepit pestis,” or “Here began the plague” is written in the register next to the entry for the Oliver Gunne’s burial on June 11, 1564. More than 200 inhabitants of Stratford-upon-Avon, one seventh of the town’s population, were buried in the second half of 1564. Of course, not all recorded deaths were due to plague, but of nearly 250 burials by the end of the year, the majority (over 130) were of children or young people, the most vulnerable to plague. Of the remainder, there were around ten more women than men. 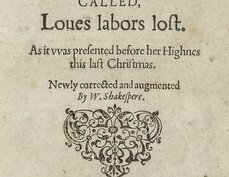 Shakespeare’s parents had lost their two first children already. With plague rampant throughout the town, it must have been an unnerving time for them. A small square fragment at the bottom right corner of the page was removed at some point before 1897, when Richard Savage noted it missing in the introduction to volume 1 of The Registers of Stratford-on Avon, in the county of Warwick (FSL DA690.S92 S95 S91). Jacqueline Simpson and Steve Roud, A Dictionary of English Folklore (Oxford: Oxford University Press, 2000), s.v. "St. Mark's Eve."